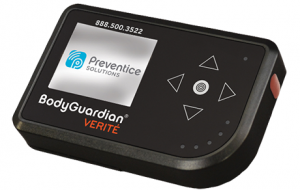 Preventice recently introduced a new version of their mobile cardiac telemetry monitor called the Verite. The Verite functions as a traditional MCT monitor in that it will automatically detect abnormal ECG activity to the Preventice diagnostic laboratory. The Verite has a distinct advantage among other MCT monitors in that it is only one module making the monitoring process much easier for the patient. Other MCT devices have 2 components which creates more responsibility for the patient to keep track of both devices and maintaining battery power in two devices. In addition to functioning as a mobile cardiac telemetry monitor, the Verite can also function as a Cardiac Event Monitor. The unique algorithm inside the Verite will automatically detect abnormal cardiac rhythms such as SVT, V Tach, Atrial Fib and Pauses.